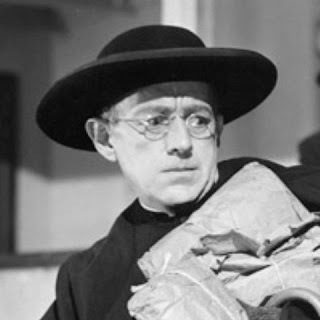 The late Alec Guinness and I have something in common: we both owe a little debt to G. K. Chesterton’s fictional character, Father Brown. I’ll talk about my debt here, and I’ll talk about the debt Guinness had to the character at the end of the post. Father Brown stories have been adapted much more often for television than for movies. An Austrian Father Brown series ran from 1966 - 1972. The six episodes of The Tales of Father Brown ran on Italian television from 1970 - 1971. The Germans had a series of Father Brown stories that ran from 2003 to 2014. But logically enough, the BBC has had the most success with the cleric. In 1974 Kenneth Moore starred in a 13 episode Father Brown series that ran in the U.S. on the PBS series Mystery! The BBC brought back Father Brown in 2014 in a series starring Mark Williams in the title role, and the series continues through the present. It can be found on Netflix. But we don’t usually do TV churches, we do movie churches. 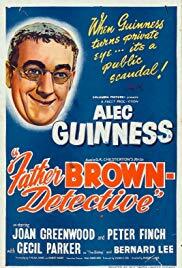 Back in 1934, a version called Father Brown, Detective, starried Walter Connolly as the priest. Germans made two films, Das Schwarze Schaf (The Black Sheep) in 1960 and Er Kann’s Nicht Lassen (He Can’t Stop Doing It) two years later. But really, only one film has done justice to the character of Father Brown, and that is 1954’s The Detective starring Sir Alec Guinness as Father Brown. The film opens with the police coming upon a crime scene. 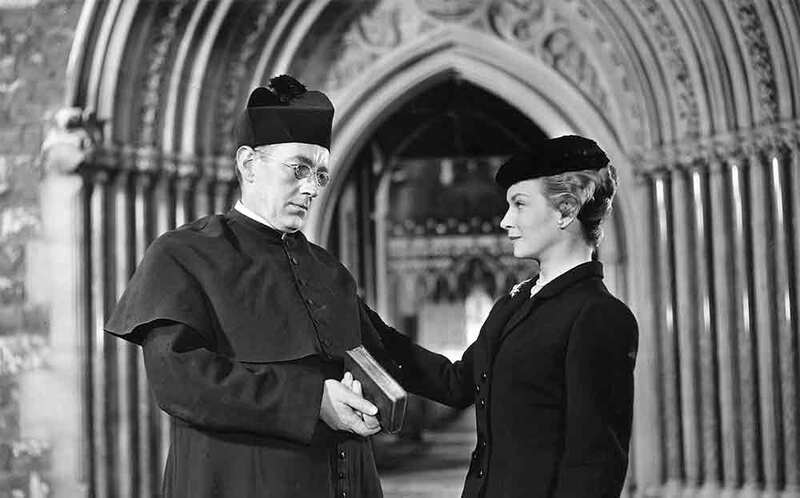 Father Brown has his head in a safe, and he tries to explain he wasn’t stealing but rather “restoring the swag of a parishioner.” The police arrest the priest, assuming he is a thief impersonating a priest. They go through a mug book looking for a suspect. An officer from another district informs them that Father Brown is, in fact, a real priest ,“I think you’ve got the genuine article.” They release him (the police can’t imagine a real priest being a thief). So Father Brown goes to see the man truly responsible for the crime, a man named Bert. Brown tells him that he is greatly disappointed in him for being a thief, but even more disappointed in him for being such an incompetent thief. “You should consider honest work,” Father Brown says -- and gets him a job as a chauffeur for a rich widow. Father Brown has one valuable item in his church, a cross that belonged to St. Augustine. (I would question the provenance of the object, but everyone in the film accepts the genuine nature of the item.) 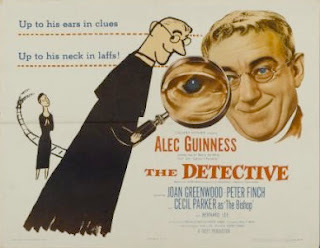 Brown plans to take the cross to a gathering at the Vatican, but the police warn him that the notorious thief, Gustave Flambeau (Peter Finch), will try to steal the precious object. Brown is excited by the opportunity to meet the famed thief and hopes to help him find redemption. 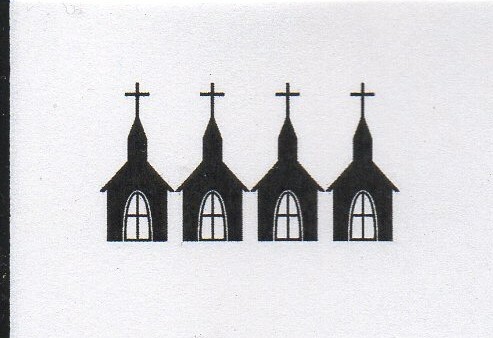 That’s why I’m giving Father Brown our highest Movie Churches rating of Four Steeples. Oh, and what did Sir Alec Guinness learn from the character of Father Brown? Guinness was raised in the Anglican church, but was essentially an atheist. Paying Father Brown opened him up to the possible goodness to be found in Catholicism, and he eventually became a convert himself. In Theaters Now: Won't You Be My Neighbor?